Having run out of things to plant in the soil cubes I turned my attention to the garden itself. 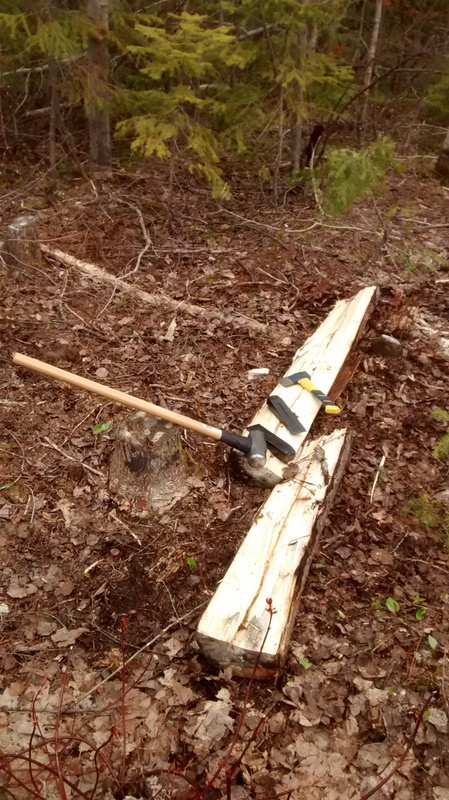 There was a lot of fallen trees and branches that had to be removed. I drew a plan for the garden during winter but of course things never go according to plan. I finally got to play with some new tools. This rock was pried out of the dirt with the hori-hori I received for Christmas. Not a nick on the blade! 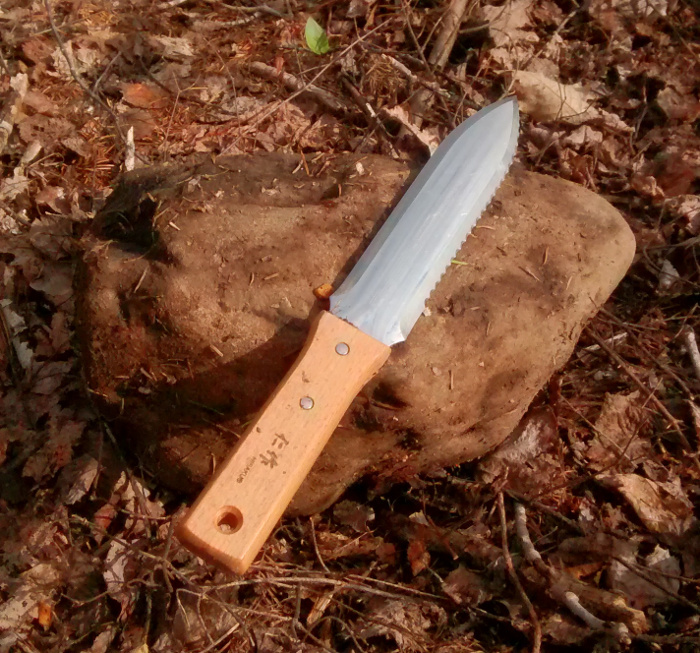 I like it although I wish it had a full tang. 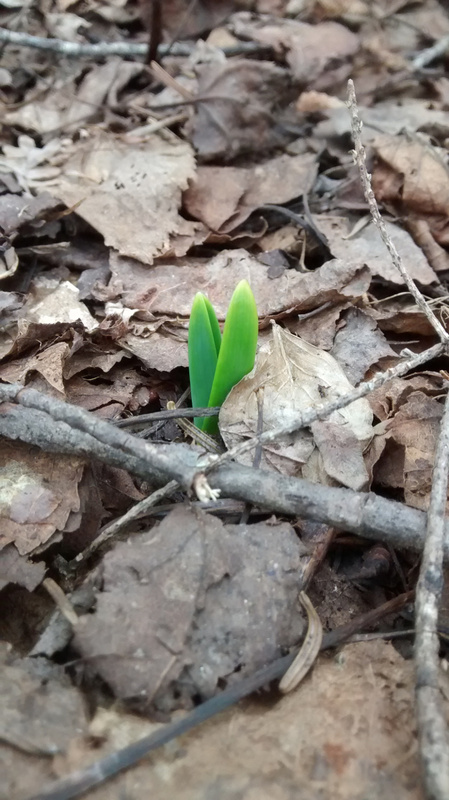 On the first of May I was excited to see a tiny spot of the freshest green poking out of the garlic patch. So tender and fresh after the long winter. Of the three garlic varieties Music was the fastest, Marino came in second and Italian Purple was last. I won’t be planting garlic this fall. 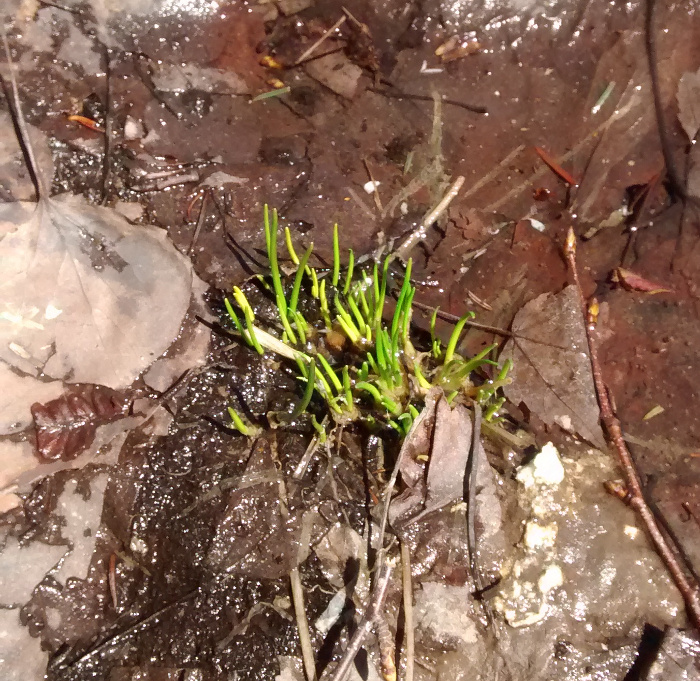 On the 4th I spotted the lonely chive again. The fact that I don’t have anything to do about it being there makes it precious to me. 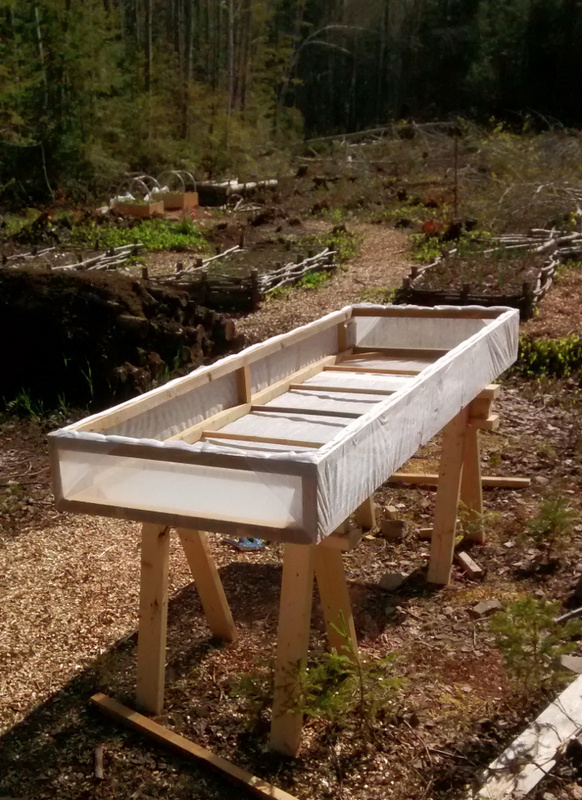 I built two small raised beds (2′ x 2′) using scrap plywood. 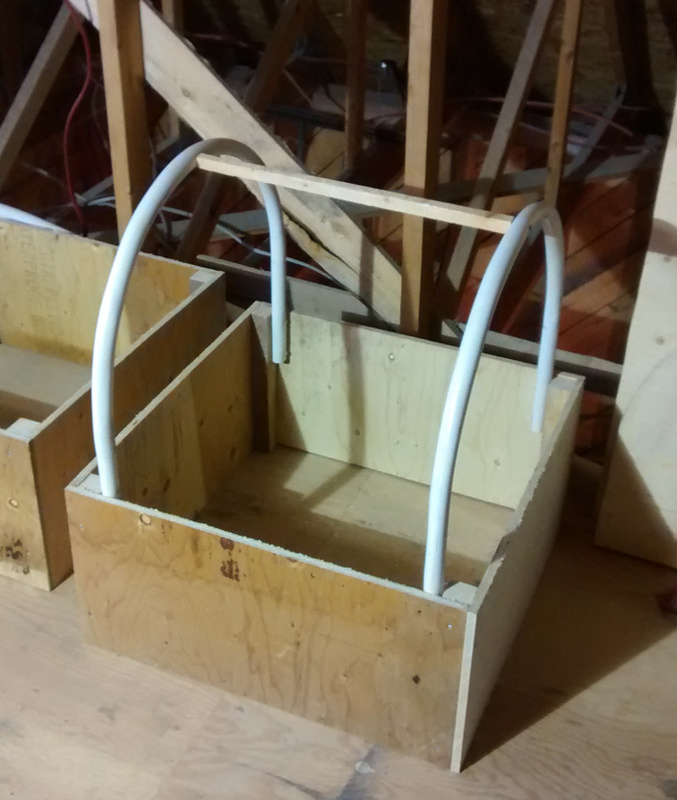 There was some PVC pipe lying around and I decided to try making some hoops to keep the row covers off my plants. I’m not keen on using PVC but I figured it was better to use it than to trash it. It’s unfortunate that PVC is so dirty because it is a joy to work with. So malleable! Maybe PLA (polylactic acid) would be an acceptable alternative? I learned about PLA while building my 3D printer a couple year ago. 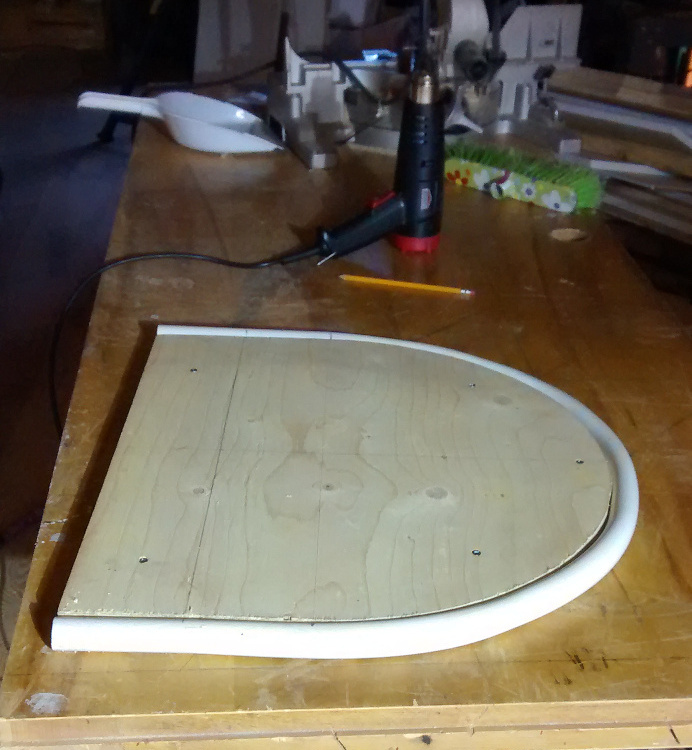 Eventually I plan on making some hoops out of wood but I can only do so much. 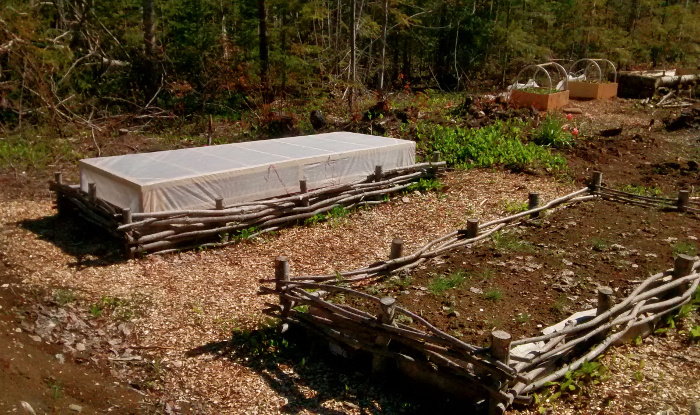 Endive, romaine, mibuna and spinach were transplanted in one of the new plywood beds on the 5th of May. 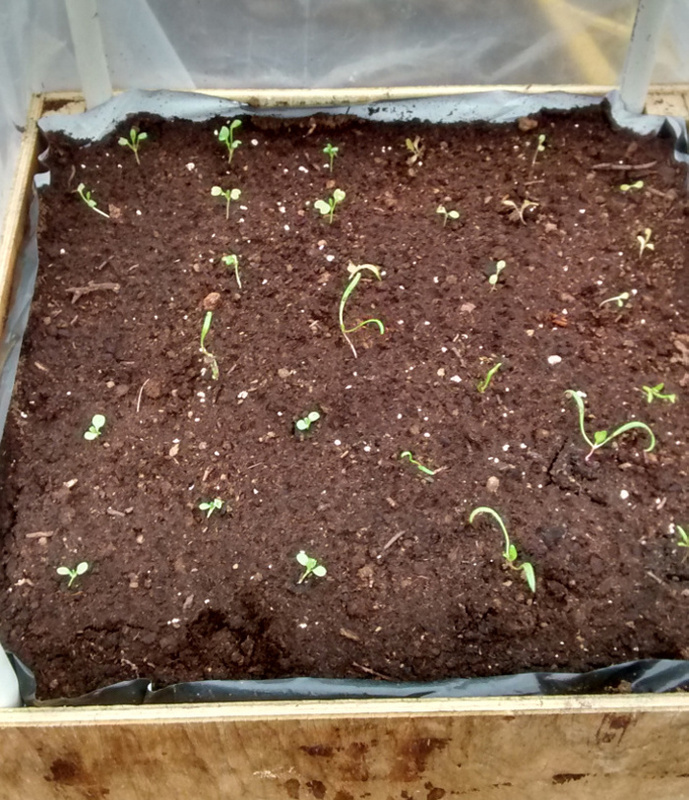 Nobody I know put out transplants that early. Maybe some farmers do? Everything was planted close together SFG style. 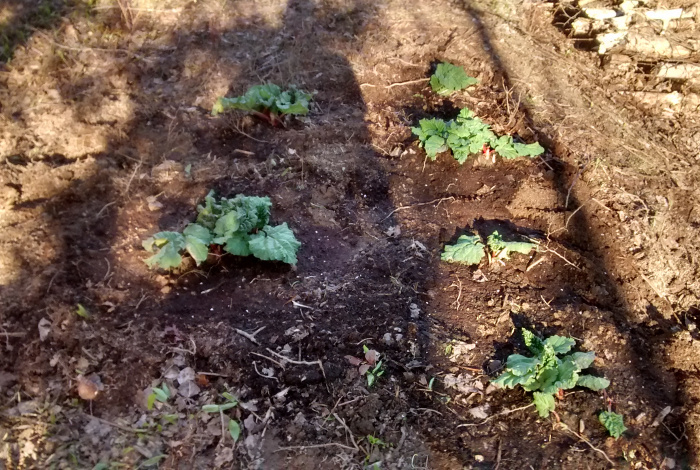 Square Foot Gardening feels cramped, I don’t think I’ll do this again. The planter really looks out of place with all this brown. 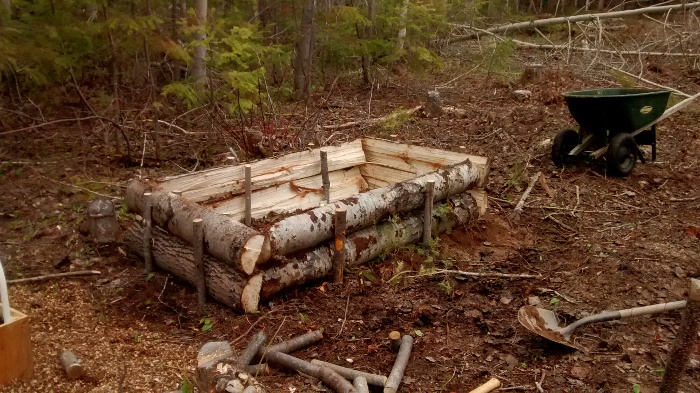 I built another larger raised bed by splitting and cutting a 8ft aspen log. At the time I wasn’t sure what would go in it. It takes a lot of dirt to fill a bed like this! 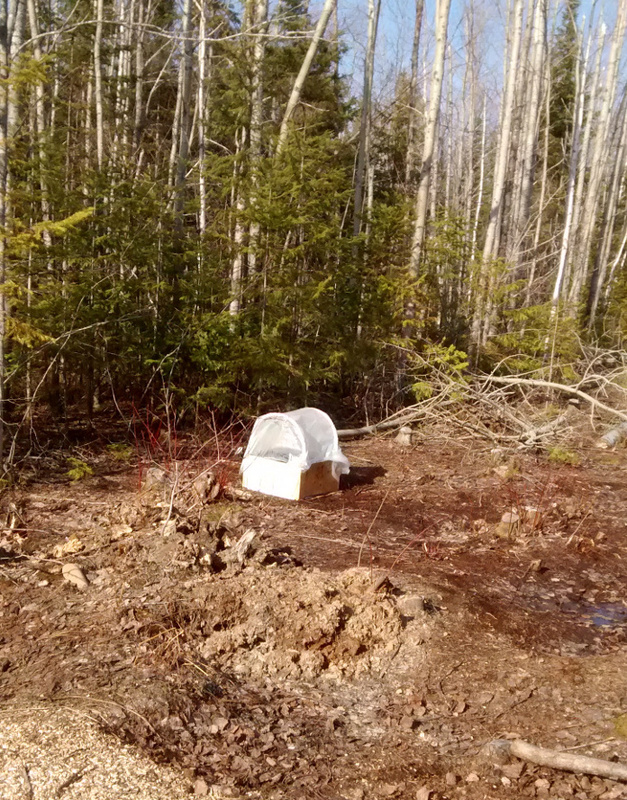 I also built a cover that fits over one of the old beds. Tender green shoots must be irresistible to critters at this time of the year. Unfortunately that bed didn’t do too well. 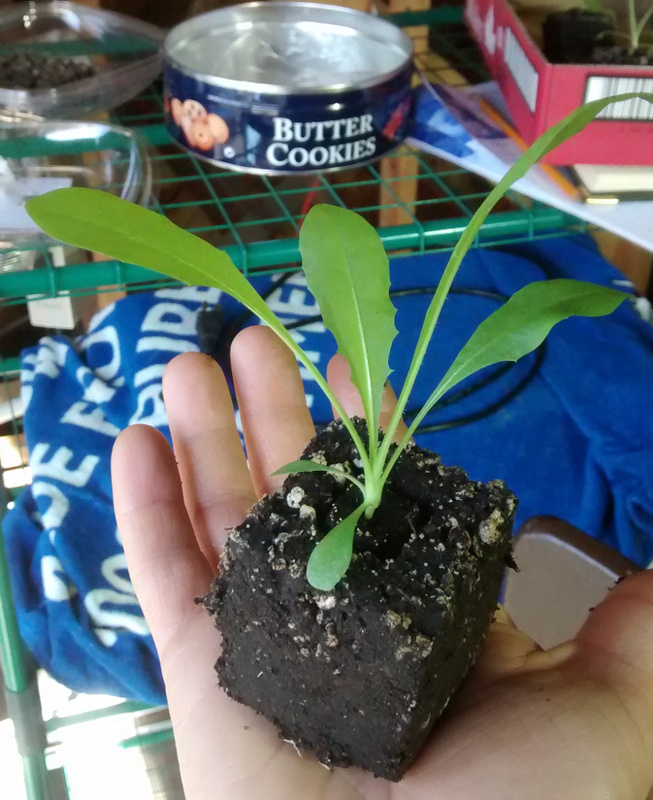 This is a wild chicory seedling growing in a 2″ cube. Beautiful!